Colonia Express is a passenger ferry company offering sailings across the Rio de La Plata in South America, connecting the Argentinian capital of Buenos Aires with the Uruguayan city of Colonia del Sacramento. Offering a safe, high-quality ferry service at an affordable price, sailing with Colonia Express is a great way to enjoy these two countries if you’re travelling on a budget. 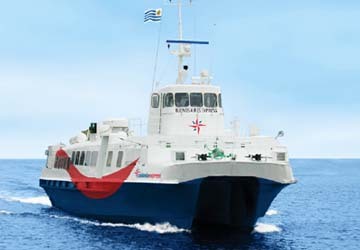 Their fleet comprises two modern, high-speed catamarans called ‘Buenos Aires Express’ and ‘Colonia Express’; the latter of which can accommodate a larger number of passengers. Each vessel comes fully equipped with the latest safety technology, too, as well as a wide range of amenities including a self-servicing cafeteria, a shop, LCD televisions and comfortable seats. As well as providing regular ferry crossings, Colonia Express offers an exclusive bus service, transferring customers between the cities of Montevideo, Punta del Este and other locations in Uruguay, allowing you to travel around the country with ease. 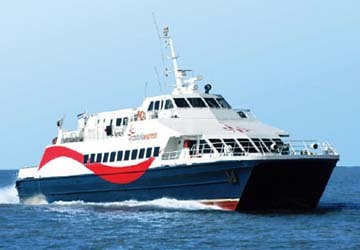 With directferries.co.uk you can find Colonia Express timetables, fares and book Colonia Express ferry tickets. 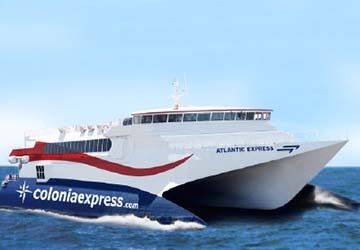 Where applicable we’ll also compare Colonia Express with alternative ferry companies.